Wooster Geologists » Blog Archive » How thick was the ice? AMHERST, MA – Our Keck project studying the construction of a glaciovolcanic ridge in southwest Iceland is in full swing and our students are hard at work on their research. You may remember that we traveled to Iceland this summer to conduct field work, then returned to Wooster, where we prepared our samples for analysis. All of the time and energy devoted to sample preparation is finally paying off. 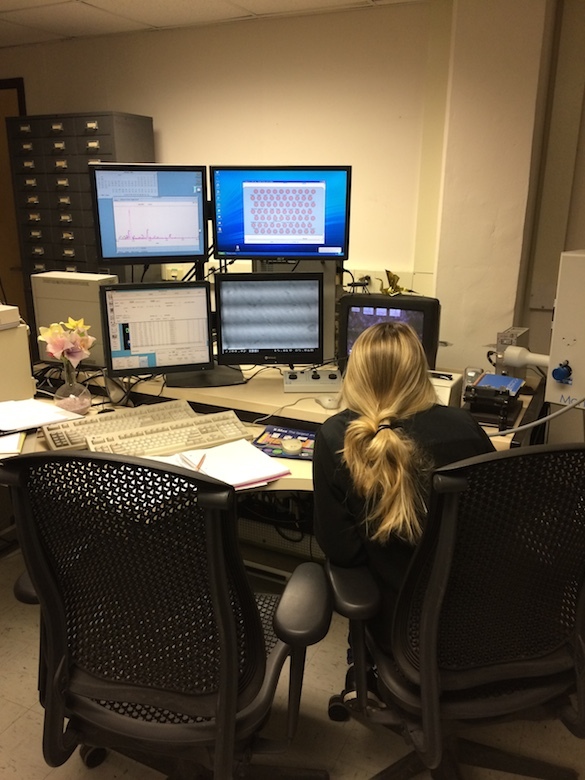 This weekend, Chloe Wallace (’17, Wooster) and I met Cara Lembo (’17, Amherst) at UMass Amherst to analyze their samples by Fourier Transform Infrared Spectroscopy (FTIR) and Electron Microprobe. 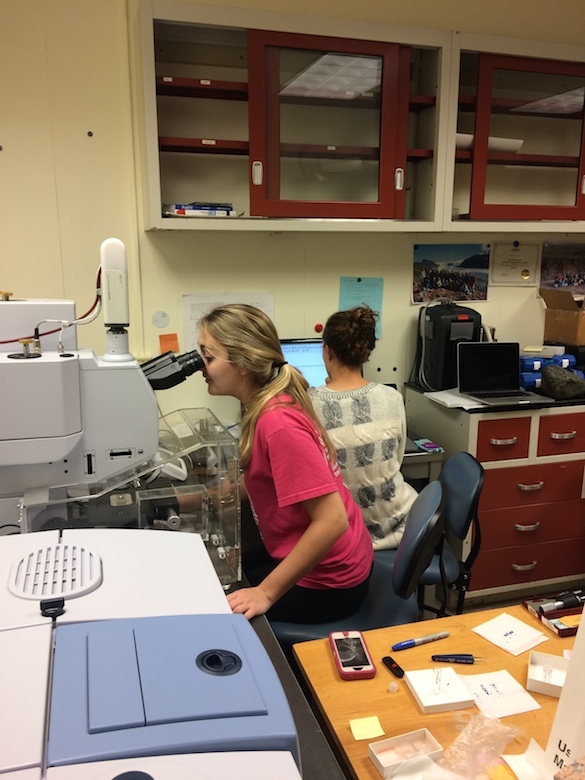 Chloe and Cara are trying to determine the emplacement pressure of the samples. The emplacement pressure should reveal information about water depth (or ice thickness) at the time of the eruption. To estimate emplacement pressure, they are using the volatile contents of the quenched glass rims of pillow lavas. Volatiles are lost during an eruption as a function of pressure; the smaller the pressure, the more degassing. So, by measuring the volatiles that are trapped in the glass, we can figure out how much pressure the glass experienced when it was formed. Prior to the visit, Chloe and Cara selected the freshest glass chips, then polished them into ~100-200 micron-thick wafers. They analyzed them for H2O using the FTIR, making sure to avoid any vesicles, crystals, and fractures. They collected nearly 300 data points on 16 samples, so they have a thorough and extensive dataset to work with. Chloe (left) is looking for an ideal measurement location on her glass chip. Cara (right) is operating the data collection and reduction software. In order to calculate water depth (or ice thickness) from H2O concentration, we use a solubility model. The model requires additional inputs, including the glass composition, which we measured by electron microprobe. After the glass chips were analyzed by FTIR, they were mounted on a glass slide for probe analysis. The electron microprobe allows us to measure the composition of a very small (micron-scale) spot on the glass chip. 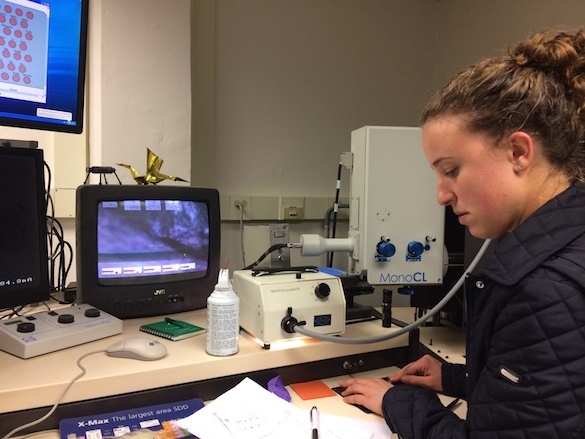 Chloe is examining her glass chips on the microprobe. Cara uses the map to find her way around the slide. 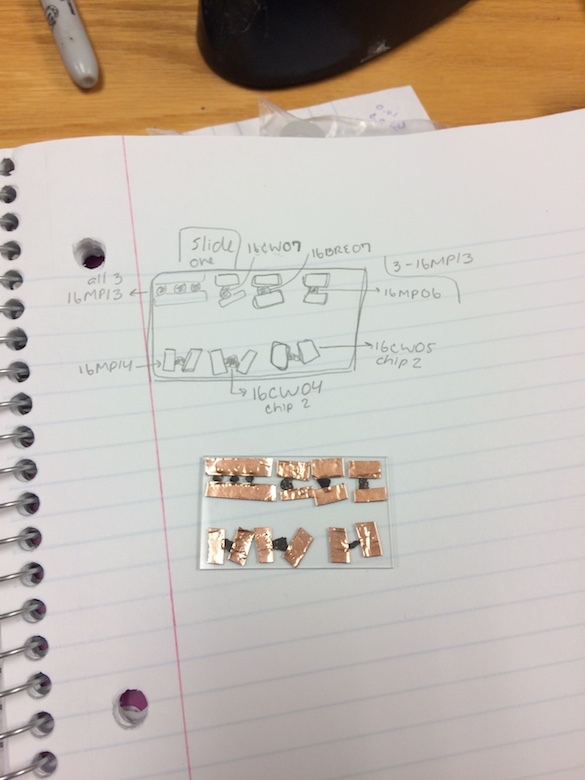 They analyzed several points on each chip, and will use those data to determine the glass composition. It was a short and intense visit, but we accomplished all of our goals. We especially would like to recognize Dr. Sheila Seaman for generously giving her time and energy. She made it all possible. Microprobes are SO cool. Good luck with the work!